New Delhi, Jan 7 :The AGP on Monday quit the alliance with the BJP over the Modi government’s decision to go ahead with the Citizenship (Amendment) Bill, 2016 which seeks to give citizenship to non-Muslim minorities from Bangladesh, Pakistan and Afghanistan. 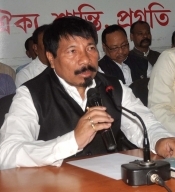 Asom Gana Parishad President Atul Bora said this here on Monday after an AGP delegation led by him met Union Home Minister Rajnath Singh. “We have made our best efforts to convince the BJP leadership about the negative impact of the Bill and the stand of the people of Assam, But the BJP has decided to go ahead with the Bill leaving us with no option but to quit the alliance,” he told the media. The Union Cabinet earlier cleared the Citizenship (Amendment) Bill, 2016 after a Joint Parliamentary Committee submitted its recommendations to the Lok Sabha. The Bill is likely to be debated in the Lok Sabha on Tuesday. The snapping of the ties by the AGP, however, does not threaten the Bharatiya Janata Party-led alliance government in Assam. The BJP has 61 members and the support of an Independent member in the house of 126 while its ally BPF has 13 members. While the AGP has 14 members, the Congress and AIUDF have 24 and 13 members respectively. Bora said: “We fought a long battle over the Citizenship Bill. We protested on the streets and we met different political parties and members of the JPC over the Bill. We tried our best to stop the Bill being a part of the government. However, now that the BJP has decided to go ahead with it, we have no other option but to walk out of the alliance,” said Bora. He said the alliance with the BJP before the 2016 Assembly polls was a demand of the time. “The Congress was in power from 2001 to 2016 and we decided to oust the Congress from power by forging an alliance with the BJP. The people did not only vote for the BJP but voted for AGP and BJP combine. However, the BJP failed to keep the promises of the alliance partner. Being a regional party, we have to respect the wishes and sentiments of the people of Assam,” Bora added.